NAP is not a short snooze that you enjoy after lunch. It’s Name, Address and Phone, and having this information appear consistently wherever your estate planning and elder law firm appears on the web is very important. NAP is sometimes referred to as Local Citation Building, and sometimes just “citations,” in case you do further research and come across this phrase. Google takes this data into account when its algorithms are placing values on sites for geographic-targeted searches. Most professionals make the mistake of assuming that their NAP or citations are consistent, but you’d be surprised how often errors occur, and how they build up over time. There are many different kinds of online directories, data aggregators and regional sites that pull your NAP information from your website and use it, without your even being aware of it. The most common problem with NAP occurs when the name of the firm changes and suddenly all of these directory listings are inaccurate. Some of them can be uncovered and updated, but others are less easily accessed. The same problem occurs if your phone number or address changes. Anytime there is a change made that impacts your NAP, you’ll need to do some digging to make sure that you update any online listings that can be updated. Best starting place? Google your practice and your name, and make sure to include Yelp, Facebook, and any regional directories. Don’t stop after you’ve gone through the first page of Google, by the way. Go at least two pages in. Why should you care about your NAP? The most important audiences you don’t want to confuse are Google and clients and prospects. If Google sees more than one address, a variation in your firm’s name, or phone numbers that don’t match, it may think that you are different law firms. It may also lower your quality score on local search. Consistent NAPS indicate authority and relevance to both the algorithms and the humans you are trying to reach. And by the way, your address needs to be complete, wherever it appears. If you use the phrase “159 Main Street, Suite 100” in one location and “159 Main Street, #100” in another, you will create some confusion for Google. The consistency of your NAP matters. You do have to accept that there may be some online listings that you will not be able to fix, but try to fix as many of them as possible. How can a busy estate planning and elder law attorney practitioner possibly squeeze in another item onto an already crowded calendar? When it comes to social media, it’s actually simpler than you might expect. Just as you would not add another practice area to your practice without doing the necessary planning, you will need to plan your social media program. The beginning will take more time, and then once you get going, it won’t be as time consuming. The best social media campaigns may seem to be casual in nature, but they are actually artfully created. They are strategically planned to bring about a desired effect, in this case to let prospects and clients know that they can rely on you and your firm to provide the best in estate planning and elder law. Almost every attorney we know tells us that they were very creative until they went to law school, and then their focus changed dramatically. We understand that! So use this time to tap into your creative side that you otherwise don’t get to engage with very often. Once you get the ideas in mind, the posts will follow. Start by creating a list of posts on relevant topics. Consider your target audience and their primary concerns. Remember that your fundamental message is that of client education and not sales. Look to the calendar. This time of year is when you want to address end of year deadlines. In January, you might discuss how a newly announced engagement changes family dynamics and may point to a need to revise estate plans. Valentine’s Day in February could inspire posts on plans for wills that include new families or second marriages. Need a break from complex documents? Do your social media planning when you need a break from more challenging tasks, like preparing complex legal documents or long meetings with clients. Ideas are all around you. We are notorious for tearing out articles and pictures from newspapers and magazines that inspire us. Some of our colleagues keep a dedicated document on their phone. Anytime a thought for a post hits, they make a note so the idea does not float away. It becomes second nature after a while. Pictures are social media too. A beautiful sunset may inspire thoughts about seasons of life, which of course includes the need for a will to care for future generations. If you see something that connects with you, chances are it will connect with others. Much of social media includes images, so your social media posts can too. Find a time that works for you. If you routinely stop for a short break mid-morning or mid-afternoon, take five minutes to create a post or two. Make it a habit, and creating posts will become easier. You may even find yourself enjoying the process! Which Social Media Platforms Are Best for Your Estate and Elder Law Firm? Our thanks to the Pew Research Center’s Social Media Update 2016 for an annual update that documents how Americans use social media today. We believe that your estate planning and elder law firm will benefit from understand the big picture when making decisions about what social media platforms are appropriate for your firm. Pew’s research confirms what many of us have already seen: most Americans get their news from social media, they look for work on social media and when they take a break during the workday, they check social media. 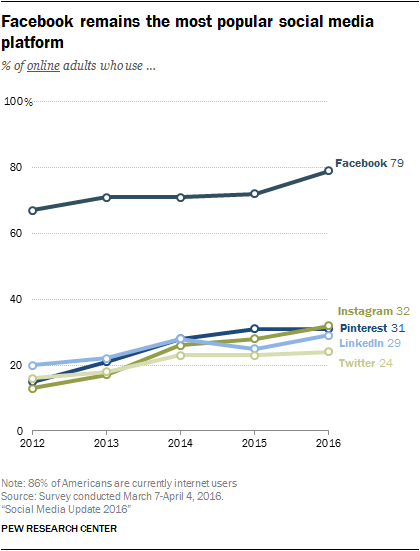 According to the Pew report, Facebook continues to lead as the most popular social media platforms among all online adults, followed by Instagram (32%), Pinterest (31%), LinkedIn (29%) and Twitter (24%). If your firm is not already on Facebook, or if you currently have only a personal profile and not a law firm business page, perhaps this is the information you were waiting for? These social media websites—Facebook, Instagram, Pinterest, LinkedIn and Twitter—are the major players in popular culture and commerce. If you are not familiar with them, here’s a quick look at what they are and how they may or may not fit in with your law firm’s marketing. As noted above, Facebook is the social networking site that allows users and companies to create profiles, share photos and videos, send messages, keep up to date with friends, post political and social commentary and use as a global online meeting place. Facebook is a mature platform that has become a robust advertising platform and dominates the social media landscape. Instagram is all about photos and videos. Phone photos can be transformed by using filters to give them all kinds of special effects. Instagram allows you to share photos on multiple social media platforms, including Flickr, Facebook and Twitter. You can also check in with Foursquare through Instagram. Think of Pinterest as the biggest cork bulletin board ever created. Crafts, cooking, health and fitness, fashion, exercise and parenting are some of the main themes of Pinterest. Users pin photos and videos, DIY guides, ideas and helpful tip. The emphasis is on finding and sharing information from a community of contributors. We hope you are already familiar with LinkedIn, but in case you are not, here are the basics. LinkedIn is a social networking site designed for business users. Once you have created a personal profile, you can network with people, and what we love best, see the networks of people who are in your own network. On LinkedIn, everyone is only a few degrees of separation away—sometimes six, but sometimes far fewer. Twitter is the ubiquitous microblogging site that gives users the ability to broadcast short posts known as “tweets.” The swiftness with which news travels around the world today is in large part due to the massive use of Twitter as a communications platform by individuals, entertainers, candidates and anyone with access to a cell phone. These are the big five. There are many others, but chances are you can reach everyone you want to reach using Facebook, LinkedIn and if you are so inclined, Twitter. Many people start out trying to be in too many places at once, and then don’t gain any traction on any platforms. If you focus on one and build it out, you may find that it does what you want—enhances your online presence, reaches people who might otherwise not know you and gives you a platform to promote your knowledge—then you can make the decision to either move to conquer another platform or stick with one that works well. Should Your Kid Handle Social Media for your Estate Planning and Elder Law Firm? This brings back memories from the 1990s, when many otherwise savvy professionals handed over their websites to their kid or someone’s relative who dabbled in what was then a brave new world. We got the phone calls when the website built by someone’s son or niece was crashing and/or wasn’t generating any new business. That was when law firms realized that their websites were far too important to be handled in such a casual manner. Today the same sentiment is informing some social media campaigns. Yes, millennials and Generation Z members are way more comfortable with social media. Their news comes from Reddit and Buzzfeed, Facebook is considered old school and as far as they are concerned, there’s no reason why they should ever be separated from their phones. But unless they are savvy marketers also, your social engagement may end up in the same place as those 1990s websites. Do they understand the market that you are targeting? Estate planning and elder law firms span a wide group of prospects, from the senior who is preparing for a spouse’s medical care to millennials who understand that they need estate planning to protect their toddler’s future. Do they know what messages your practice wants to convey? One estate planning law firm may restrict its clientele to those with estates valued at $15 million and above. Another may not have any asset-level in mind when reaching out to clients, as associates handle smaller asset estates and partners speak with the multi-millionaires. Different practices have different messages. Are they all Twitter, all the time? It often seems like every day brings another new social media platform. While your Generation Z or millennial helper is more likely than a practicing attorney to be tuned into the latest social platforms, consider your target market. If they are all over Facebook with photos of their grandchildren and their golf games, you won’t reach them on Snapchat in 2016. We know, you might reach them there in 2017, as the number of people and the age of users on Snapchat are growing. But not this year. Do they understand law firm culture? A series of over-the-top claims could swiftly land you and your practice in front of the bar association’s ethics committee. Posting private information about clients, even in the most positive manner, could be equally damaging (and costly) to your practice. And law firms, even when they are somewhat casual, are expected to maintain a certain level of professionalism at all times. If Uncle Freddy’s nephew is a wiz at social media for lawyers, then it’s worth a conversation. Otherwise, have someone in your office or a professional manage your social media. From all of us at Integrity Marketing Solutions, we hope that Thanksgiving finds you surrounded by the warmth and love of family and friends. Getting online reviews of your estate planning and elder law firm is step one. If all you did was collect online reviews, that would be good, but not great. To maximize your online reviews, you want to leverage them and use them in a variety of different ways. Start by conducting an inventory of the reviews so that you know what you have to work with. Making this a monthly task, for yourself or a team member, will serve a few purposes. It will remind you that you need to ask raving fans for online reviews, create content for blog posts and email newsletters, and keep you current on your online presence. Once you have an inventory list of online reviews, consider what belongs where. For instance, a blog post that consists of a short, two-sentence testimonial is going to leave a lot to be desired. But that same short two-sentence testimonial will fit perfectly in a testimonial section on your website. Just be sure to ask IMS to alternate long testimonials with short testimonials so the page will look more balanced. If you have a testimonial that reads like a short novel, that’s perfect for your blog. Remember to alternate testimonials with news items and other topics on your blog, so that it’s not one long stream of testimonials. Consider adding a reviews section to your email newsletter. If your newsletter is made up of sections, like a newspaper, add an online review section that will be included in every edition. This way, your readers will expect to see a good review every time they receive the email. Remember that one of the key elements of marketing is repetition. When someone sees a positive review once, it registers. When they see it again, or when they see a second and a third positive review, the message becomes clearer with every repetition: this is a great law firm that solves client problems. Especially in today’s crowded media environment, messages must be delivered more than once. Online reviews can be used in non-digital marketing also. If you have a print newsletter or a firm brochure, you may want to dedicate some space to include these reviews. Yes, these hard copy marketing tools are still used by many law firms. Something a little unexpected in a law firm: a self-published book of reviews for clients to leaf through while they are waiting in your reception area. Edited selectively, this collection of reviews would reinforce your client’s sense that they are in the right place, meeting with the right lawyer to help solve their problem. Your raving fans are the best people to ask for reviews of your law firm. The ones who were so worried that their aging mother would not be able to qualify for Medicaid or who could not imagine how or if they would be able to legally prevent an adult child from squandering a small fortune. A review of the firm’s client list will jog your memory if you don’t remember the top 50 raving fans. Next, consider who these raving fans are and their level of comfort and skills with social media. Someone who spends a lot of time online is going to be more comfortable with posting a favorable review on a site like Facebook, Avvo or Google My Business. A client who is barely comfortable with email (and yes, there are still those people) or one who is extremely private may not want to participate. A third type of client will be more comfortable simply sending you an email about their experience with the firm and be willing to let you post it on your website in the testimonials section. Ask for permission to use their review and their first and last names or if they would prefer just their first name and last initial. Offer the option to post the review as anonymous if that is their preference. Be sure to follow your state bar’s guidelines for maintaining client privacy and complying with terms of professional ethics. Above all, you want your clients to be excited about sharing their positive experience with the online world. If you sense any reluctance, let it go—we’re certain you have plenty of clients who would be happy to do so. There may be some attorneys who ask for reviews while they are working with clients, but we don’t think that’s the best way to go. For elder law and estate planning law firms, we recommend that you ask for reviews after your matter has been concluded. Don’t wait too long afterwards—maybe a week or two—and then ask. Here’s a thought for those of you who are really dedicated to customer service as part of your practice. Consider having one of your team members contact clients a week or two after your work for them has been concluded for a client satisfaction follow-up call. This would be an ideal time to ask if they had any questions, if all of their concerns were addressed, and how they felt about their experience with the firm. Not only does this provide the perfect opportunity to ask them about providing a review, but it also allows you to identify areas of your firm’s strengths and weaknesses. If, for example, more than one client says that they were not happy about how long it took for questions to be answered, then you will know that your team needs to do a better job of educating clients about how long it takes for a lawyer to conduct research. If you hear rave reviews about your administrative staff, you’ll know that there’s a great team in place. If you haven’t already experienced one negative online review, congratulations, but understand that sooner or later, it probably will happen. Even the most diligent and service-oriented estate planning and elder law firms come into contact with difficult clients or difficult situations that lead to a negative review being posted. It is never pleasant; no one likes being accused unfairly. And just like you would not fly off the handle in person, although you might want to, you’ll need to handle this negative review in the most productive manner possible. First, take a deep breath. Next, verify that the person actually was a client or a prospect. Gather up office notes, documents, billing records and any pertinent material that relates to this person. Make a thorough review of the materials and figure out where their complaint came from. Was it a misunderstanding, or did your office drop the ball? Were their client expectations that were not addressed from the start of the relationship? Or was a court decision not in their favor? Once you have identified the root of the complaint, you’ll have the information you need to make the best possible response. Few things are more frustrating than a negative online review. You cannot control what people are posting, and while you may know the complete story and, equally important, the personality behind the negative review, the public does not. Unless…. Worry less about a negative review with improper spelling, poor or no punctuation and excessive use of capital letters. Anyone reading an online review will recognize that the person writing the post is coming from what we politely call a bad place. A thoughtful negative online review that is well written and contains a lot of detail is more damaging that one coming from an emotionally overwrought person. Next, consider the correct response. Has the matter been dealt with? Is the court involved? The local bar association? Depending on the situation, it may be prudent to hold your fire until the issue has been resolved. Once the issue has been resolved and you are cleared to comment, it’s time for a thoughtful response. Then address the issue, within the parameters of the law and your legal and moral obligation to protect the privacy of clients—even those who are disrespectful and/or out of control. Describe the issue, in simple, clear terms, so that the next person reading the review will understand the problem and how it was addressed. If the client was not willing to participate in the resolution of the problem, include that fact also. Close your statement with final sentence repeating your firm’s message of service, compassion, commitment to client satisfaction and quality work. Always take the high road, especially with online reviews. They live forever. And then, make sure that you ask what we call your “raving fans” to add their reviews to the page. If you have 45 great reviews and one angry negative review, the message will be clear: your firm does great work and cares about clients. There was a time when more than a few attorneys tried the ostrich approach to online reviews. They just refused to recognize the comments made by clients on Avvo, Google and a number of other websites. That may have been passable years ago, but today no professional can afford to overlook online reviews. They are simply too important to your client’s decision making process. Online reviews have become part of our culture. We rely on reviews to schedule vacations (TripAdvisor), hire a plumber (Angie’s List), check out a doctor (Consumer Reports), and make a reservation for dinner (Yelp). People have their favorite sources, and they count on reviews despite a plethora of information (found online, of course) that loudly proclaims that most online reviews are either paid for or not valid. Whether you believe in the authenticity or accuracy of online reviews or not, they are not going away anytime soon, so the best strategy is to make them work to your advantage. Avvo is one of the best known attorney review sites. If you are a practicing attorney, you have an Avvo page whether you have added information to it or not. Some attorneys purchase ads on Avvo to keep their listings above other attorneys. In a highly competitive market like estate planning and elder law, this can be productive. Yelp may not be the first place you would look at for a professional, but many people do. And many law firms run paid ads on Yelp. Lawyers.com is from Martindale-Hubbell® and well regarded by attorneys and clients alike. Be aware that there is a company at the website “lawyer.com.” It is NOT the same website as the Martindale website. And of course the 800 pound gorilla in the room is a five-star Google review, which can pack a lot of power for your law firm, as can great reviews on Facebook. Attorneys ask us whether or not they should place paid ads on these types of websites. The answer: it depends. The most reliable way to know if placing ads on online review sites will work is to try it. Don’t commit to an extended period of time, but do commit to enough time to get a sense of whether or not this might drive calls or website visits. Be as methodical with online review site ads as you are with any other marketing effort: measure hard data, not anecdotal events, to determine effectiveness. Don’t dismiss the idea of a party planner. If you are having more than 50 people in your office or at a restaurant, a party planner can save you time and money. She or he will be able to negotiate better prices for food and drink, handle the guest invitations and add a few unexpected touches. Plan an activity within the party. Depending on the age and attitude of your guests, you or a party planner should be able to come up with a number of activities to keep everyone entertained. Games designed to foster networking have a place at a holiday party also. One of our favorite holiday party games is the White Elephant Secret Santa game. Everyone brings a great gift and gets a ticket. As the ticket numbers are called, the person can take a wrapped gift from the pile or steal a gift from someone else. The results are hilarious. Ugly Sweater contests add a lot of laughs too. Holiday party in your office? Don’t skimp on the decorations. Strike a balance between tasteful and fun. This year, we are looking for snow globes to add a fun festive note. They come in all sizes and shapes and even the most serious people like to simply pick them up and watch as the flakes swirl. There’s a serious side of holiday office parties. If alcohol is being served, there is the potential for liability on several levels; social host or dram shop liability and your responsibility as an employer that is responsible for the acts of employees. Check with your insurance agent to make sure you have extra coverage for a party in your office. You’ll want to remind employees that sexual harassment is not acceptable at any time, especially during holiday parties. Some firms invite spouses and significant others to holiday parties based on the theory that most people behave better if there are people they don’t know in the room. Be generous with food, especially if you are serving alcohol. Make sure that you have enough sturdy finger food during the early part of the party so that people who are drinking are also going to be eating filling foods. Serve dinner or main courses on the early side. Keep an eye on the clock. If your party is on a work night, people will want to get home with enough time to wind down and get a good night’s rest. Plan out the timing and have someone, a party planner or the office manager who rules with authority, assigned to make sure that things happen on time: cocktails starting at 5:30, dinner at 6:30, activities and desert by 7:30 PM. In other words, have a great party but keep it sensible, safe and secure.